The original Spirograph sets came with a sheet of thick corrugated cardboard to use underneath the paper so that you could hold the wheels down with the supplied pins. When we were kids, more than one of us wanted to play with the Spirograph at the same time, so we cut out pieces from cardboard boxes to use as a base. These weren’t satisfactory, however, as they were too thin for the pins to go through all the way and hold the wheels tightly to the paper. What’s more, they would develop folds that made it harder to draw a perfect design. And eventually, the boards supplied got so full of pinholes and little-brother scribbles, or got bent or stepped on, that they became a source of frustration. For decades now, I’ve kept my eye out for triple-layer corrugated cardboard to use as a working surface for my Spirograph. But I’ve finally found something better – a small cork bulletin board. Designed to hold shopping lists and memos in a busy household, it has a wooden frame and a flat surface, ideal for Spirographing. The cork holds the pins tighter than does cardboard. You can probably find one of these boards at a dollar store, hardware store or department store. Look for natural cork, not fiberboard, as it is denser and will stand up better to being poked with pins. Here’s a natural cork bulletin board on Amazon that looks good to me. It is a little bigger than mine, but a convenient size at 11 x 17″, and most importantly, it has a “natural, self-healing cork surface”. You don’t want bumps in the road of your fine felt pen as it navigates around and around. Or maybe you have an even better solution. If so, tell us in the comments. [Picking my jaw up off the floor] That’s genius! I have to try that. I’m happy with the putty now, but I’ve got to try your magnet trick, just for fun at least! As for technique, yes, I think it’s got a lot to do with practice, and catching the rhythm of the pattern and going with it – sort of like ballroom dancing if you’re the woman. Keeping the gears from slipping and popping out of the ring as I spiro is a dealbreaker for me. I’ve seen knock-off spirograph type toys that have a “lip” on top of the gear to keep the inner gear in place. Would be wonderful if Spirograph could adopt something like this in their future designs. Interesting idea. Such a lip wouldn’t have to be very big – maybe just to the end of the teeth on the rings – to make a big difference, and wouldn’t even interfere with hole #1 on the wheel. Sorry you’re finding it so hard, though. Are you using an older set or a new set? The gears in the old sets are flat while the new ones tend to warp. Try keeping the pen vertical and only push as much as necessary to keep the gear moving and the teeth engaged. The pressure is always towards the meshing gears and lean just a bit in the direction you’re going. 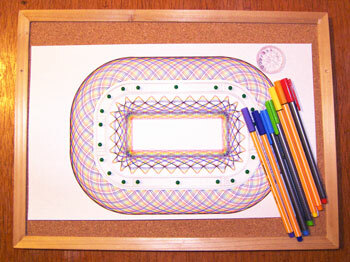 A perfectly flat table helps too; spirograph has shown me the subtle warps on my desk. They also sell pins and pens… the latter being available in several styles – either refills or entire pens of the old style retractable ball point with the thin tips, and a new 10 color in one pen which includes black, blue, red and green, yellow, light blue, pink, purple, brown, and orange. I don’t think foam core had been invented when I was a kid. It would be much better than cardboard. Thanks for the link.